Save $4,000 per couple on this departure. Click here for eligible departures. Enjoy a relaxing morning on board as you cruise in style into the beautiful 13th century port of Libourne. Whilst cruising, perhaps drop into Scenic Culinaire for a French cooking class. You’ll spend the afternoon in the nearby town of Saint-Émilion, an absolute visual feast and the jewel of this ancient wine growing region. You’ll also get to explore the underground catacombs of the Monolithic Church – a true trip highlight. Freechoice: Enjoy a guided tour of Libourne and view its quaint 16th century town-houses and Gothic church. Alternatively, explore the exclusive estate of Château Franc Mayne and taste its Grand Cru Class wine, or view the eclectic city of Bergerac and enjoy foie gras tasting at a charming local farm. Travel the scenic Médoc wine route today and discover why this region is viewed as the world’s leading red wine producer. Afterwards, sample the region’s finest at the Château Gruaud-Larose estate, or cycle to Château Lagrange, featured on Napoleon III’s 1855 Classification, for a wine tasting. Venture into the Sauternes region for a tasting of the prestigious Château Guiraud dessert wines. Alternatively, cycle through the rolling vineyards of Sauternes to the Grand Cru Class estate of Château Myrat for a tasting. Freechoice: Shop with a Chef at a local food market and cook up a storm in Scenic Culinaire afterwards. 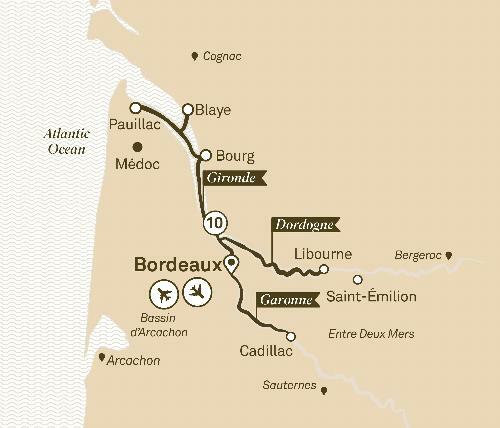 Or enjoy a guided tour of Bordeaux and her many attractions. For the more energetic, cycle the historic regions of Bordeaux. Cross beautiful bridges to witness sites such as the Royal Gate and the Palais Rohan, before cycling through public gardens back to the luxury of your floating hotel. Freechoice: Join a walking tour of Arcachon including a visit to the local Baltard market. Or climb Europe’s largest sand dune and drink in the expansive panoramas. Or for those fancying something sweet, why not stay on board and enjoy a fabulous Mademoiselle de Margaux chocolate and wine pairing event. Alternatively, take a local tram to the newly opened Cite du Vin museum and enjoy an interactive journey of wine discovery. Freechoice: Discover the Carriages Museum in the enchanting Bourg Castle including a visit to the 16th century passageway to the guards rooms and immense WWII oil tanks. Alternatively, spend a full day exploring the fortified town of Cognac, renowned for its production of fine brandy. Afterwards, enjoy a tasting at the acclaimed property of Rémy Martin. Freechoice: Stroll through the charming Citadel of Blaye, or join a 30 kilometre roundtrip cycle along the Captain’s Road which is so named in honour of the WWI Captains who chose to purchase their homes along this beautiful stretch of waterway in the early 20th century. You’ll have the opportunity to enjoy an exclusive cooking class in Scenic Culinaire or simply relax on board as we cruise past beautiful uninhabited islands bound for Bordeaux. The name Bordeaux has always evoked impressions of quiet sensual pleasure, where the civilised and the natural coexist in easy harmony, and wine lovers are free to engage in their favourite pastime – savouring the world’s finest wines. In fact, the reality of Bordeaux is not that different from the romantic impression most people have of it. Extraordinary landscapes, delicious fare prepared with a finesse characteristic of the French, winemaking that has been refined to an art, and a wealth of historical riches, from elegant châteaux to churches that have been around for longer than most of the new world. Visit Grand Cru Class wine estates, explore the Cognac region and sample its famous brandy, or fresh oysters from the waters of Arcachon Bay. You’ll find that beautiful Bordeaux is everything you imagined it to be, and more.